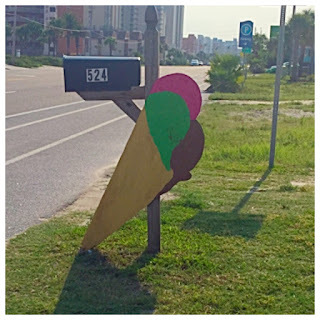 What do you do when you are at the beach and you need to cool off? Well, of course, you might jump in the ocean or pool, but we had a different idea. I was remembering the amazing shave ice in Hawaii, wishing there was a way to get one of those. 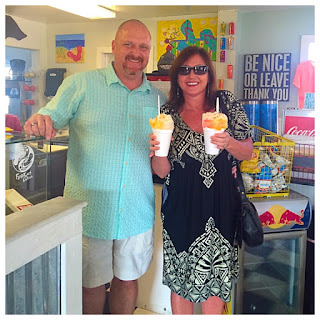 Luanne, ever the practical one, wondered if there wasn't a place to get shave ice in Gulf Shores, so we did what we usually do, we googled. There were some of those sno-ball or snow cone vendors, but that was totally NOT what we were looking for. 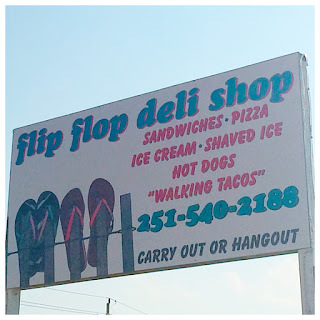 Finally we found a place called Flip Flop Deli Shop that had gotten a lot of good reviews for their "shaved" ice. I was a bit skeptical when I saw the word "shaved". The delicious tropical icy goodness in Hawaii is never called "shaved". It is always called "shave" ice. 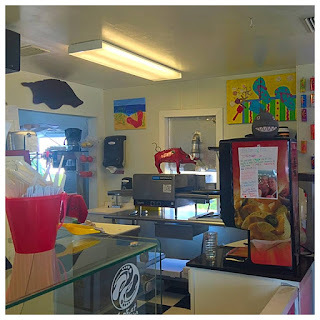 It made me wonder if this was going to be just another sno-ball in disguise, but with Luanne's encouragement, we set our sights on Flip Flop Deli Shop. We knew we were at the right place when we saw the ice cream cones on the mailbox. Happily, Flip Flop Deli Shop was conveniently located near our condo on West Beach Boulevard. We climbed the stairs with a lot of hope, but prepared to be disappointed. Hawaii had set our expectations pretty high, after all. 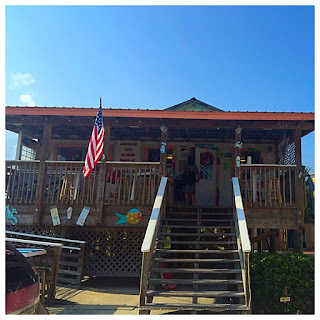 When we got inside, we were greeted by a gentleman who turned out to be the owner. We noticed that the place was decorated with an inordinate number of pigs. 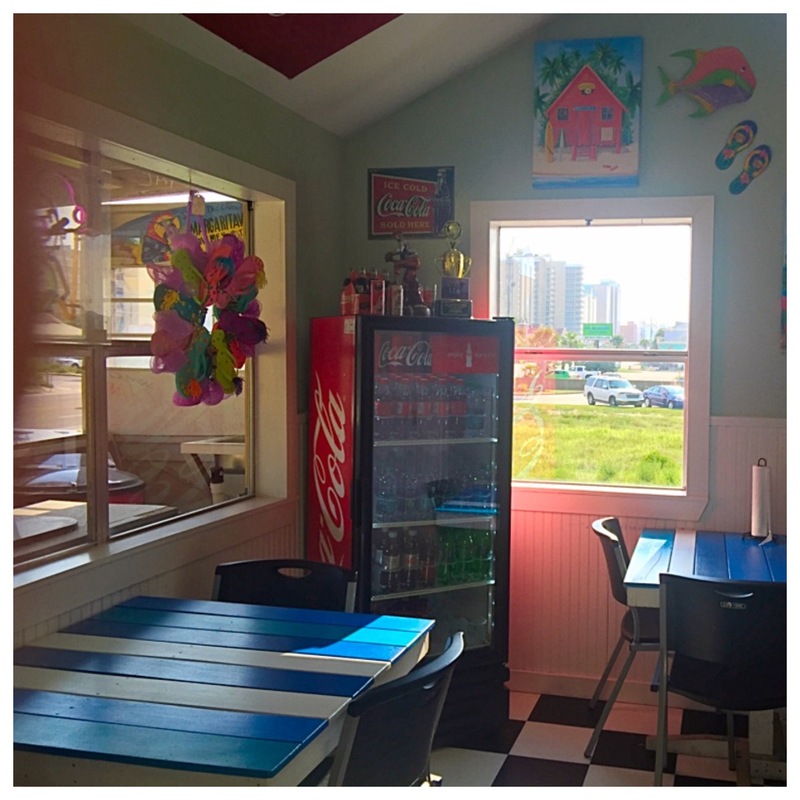 I assumed there must be barbecue on the menu, but it turns out, the owner is an Arkansas fan! No matter what you do or where you go in Alabama, football is somehow going to figure into the conversation. You know it wasn't the Arkansas chemistry department he was pulling for! After we discussed football for a bit, we got down to business. Lu and I were pretty brazen about what we were there for. Luanne told him we wanted something special and when we described it to him, if he could make it for us, he would need to put it on his menu and name it after us. He looked a little unsure, but encouraged us to proceed. First we needed to ask him some questions. Did he have shave ice, not snow cones? He told us he did. Even though "shaved" was clearly on his sign, we just wanted to make sure he knew the difference. He did. Could he, put some ice cream in the middle of the shave ice, like they did for us in Hawaii? Yes, he could add ice cream to the shave ice. It would be in the bottom and not in the middle, though. Good enough. Finally, did he have snow cap for his shave ice? Yes, he did. Great, he passed our exam with flying colors! We were in business and ready to pick our flavors. Now for the bonus question. How many flavors could we pick? As many as we wanted! Good answer! 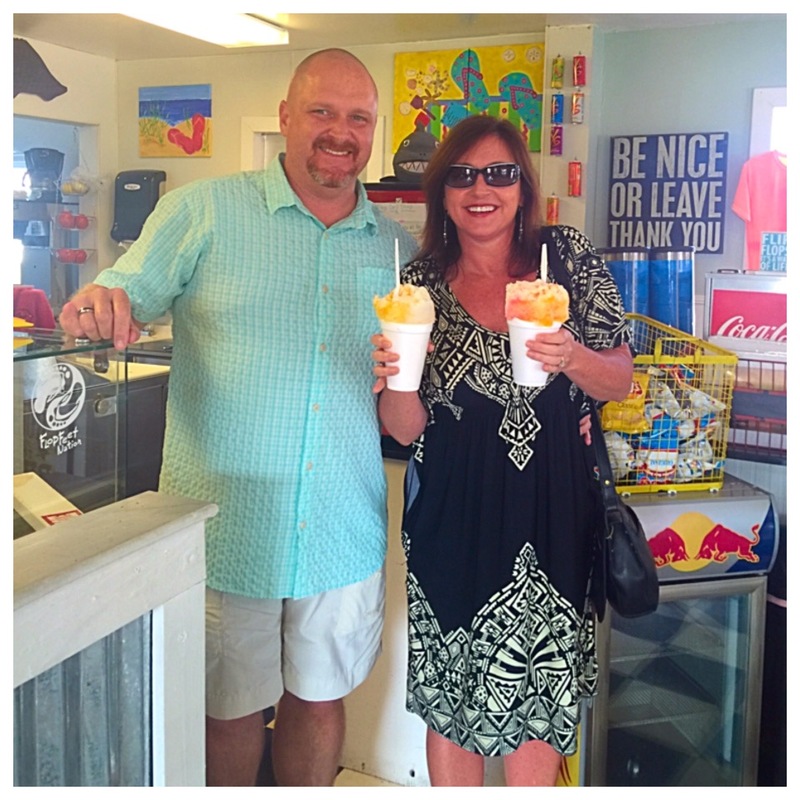 The two of us are always going to go tropical if we have an option, so we both chose mango and coconut. I also happen to love tiger's blood, which is a usually a combination of strawberry, watermelon and coconut, so I added that to my shave ice. We watched as our ice came out of the machine. This is one way you can tell the difference between shave ice and snow cone ice. 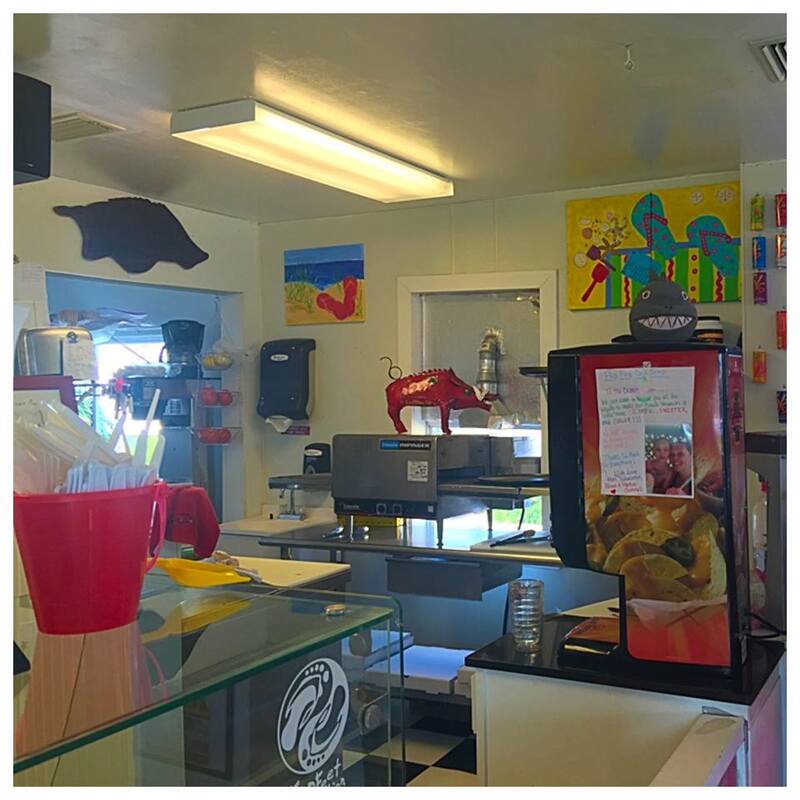 Authentic shave ice is made to order, not pre-made. Shave ice is also fluffy, not crunchy bits. The shave ice machine at Flip Flop Deli Shop might not have been as big and elaborate as the ones we had seen in Hawaii, but it really did make fluffy shave ice, not just crunched up ice bits. We both chose vanilla ice cream, since that was about the most tropical option available. We really wanted the homemade coconut or macadamia ice cream we had in Hawaii, but this is Alabama, so we went with vanilla. Maybe our friend will really up the ante one day and add coconut and macadamia to his list of ice cream flavors. Maybe? Here is the almost finished product. I say almost, because I snapped the picture before I remembered we hadn't added the "extra, extra" snowcap, as my friend, Kelli, would say. 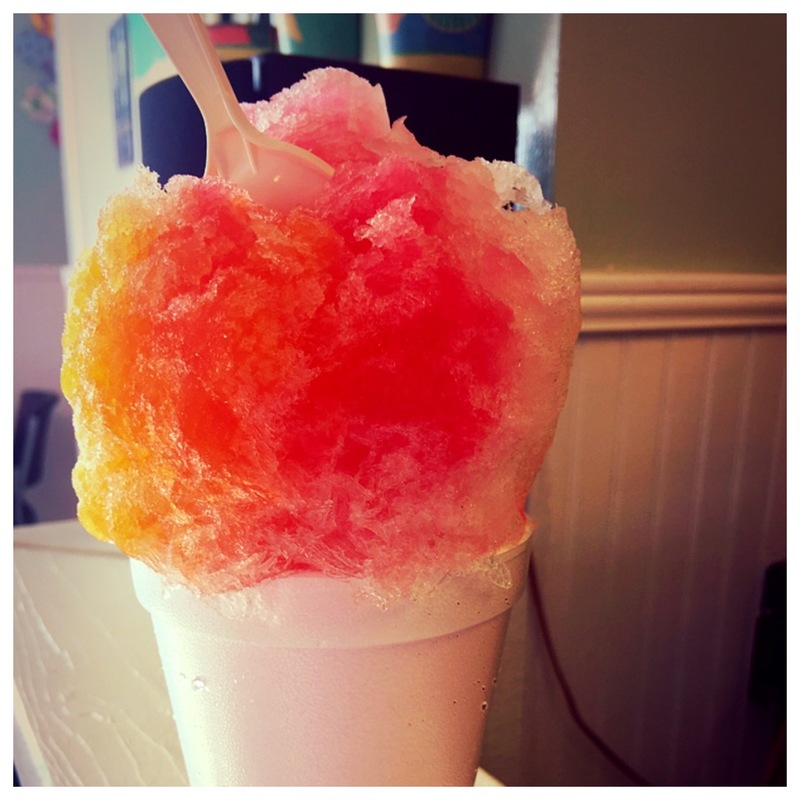 We do love that creamy sweetened condensed milk poured over the top of our shave ice. So, what did we think? We were really happy. Of course, it wasn't Hawaiian shave ice, it was Alabama shaved ice. The ice cream wasn't homemade coconut or macadamia and the flavors weren't hand squeezed from fresh tropical fruits, but it was really good, definitely hit the spot and cooled us off. The owner is super nice, fun to talk to and eager to please his customers. He never once blinked when we described the way we wanted our shave ice to be put together. I actually think he combines ice cream and shave ice all the time and was just humoring us, but his fun personality was part of the charm of the place. We christened this particular concoction the RichiLu and I think he agreed. So, if you go to Flip Flop Deli Shop, just tell this nice guy you want a RichiLu and he will fix you right up! See, we've done all the work for you. We want to go back and check out the rest of his menu sometime. There were all kinds of sandwiches...roast beef, turkey, grilled chicken and ham...and he definitely isn't showing any partiality when it comes to naming them. You can choose from the Geaux Tigers Special, Pig Sooie, or the Roll Tide or War Eagle Wraps. The Roll Tide Wrap is made with turkey and the War Eagle Wrap is made with chicken, so he may or may not have been making a subtle statement with those! He is an Arkansas fan after all. We will let that slide, since he makes such a great "shaved" ice! 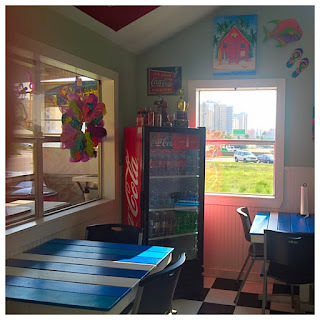 Three Friends and a Fork give Flip Flop Deli Shop in Gulf Shores 3 Icy Yums UP!